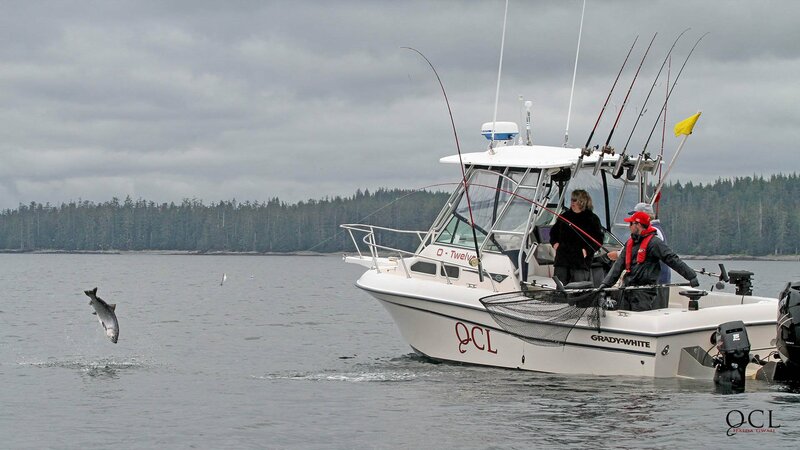 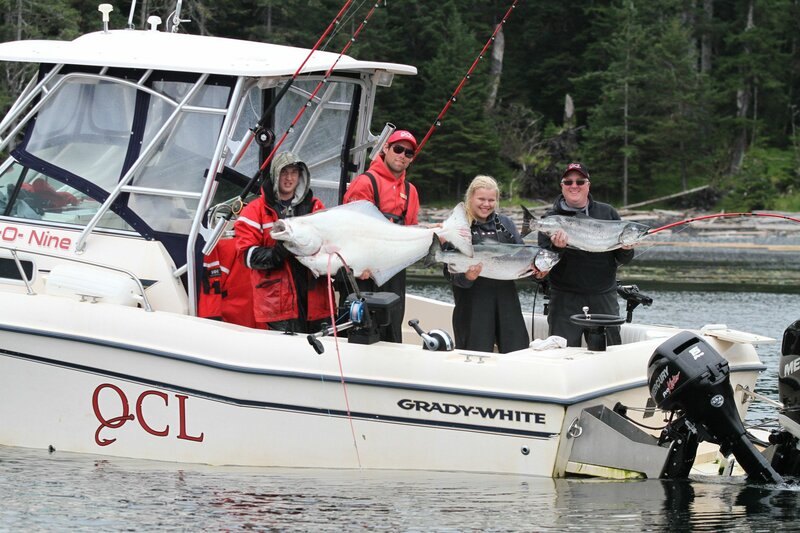 Queen Charlotte Lodge is home to some of the world’s best fishing. 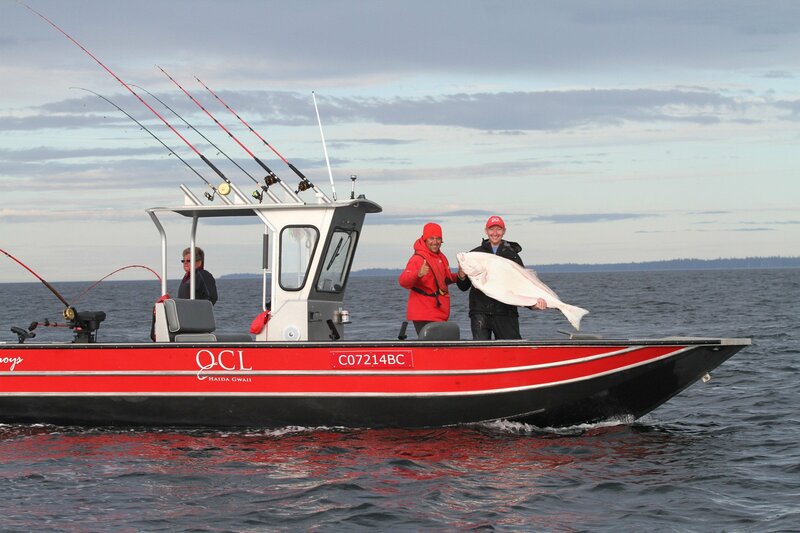 Whether it is the thrill of the catch or a thrill for your taste buds, QCL has what you are looking for. 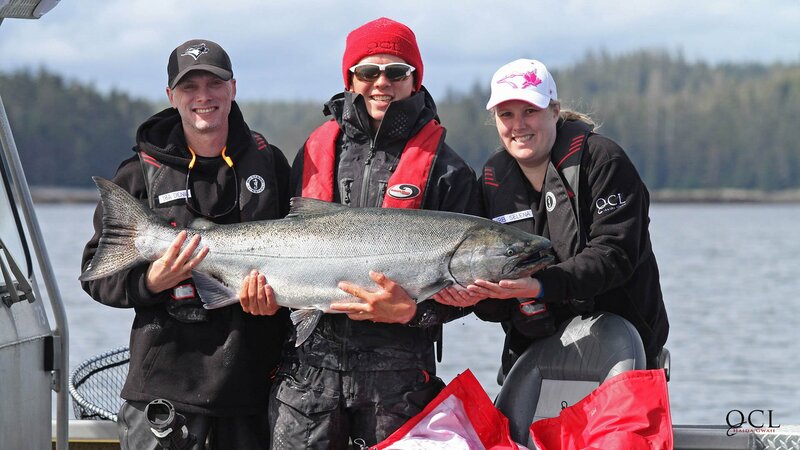 The Chinook Salmon is the largest and most prized gamefish of the salmon family. 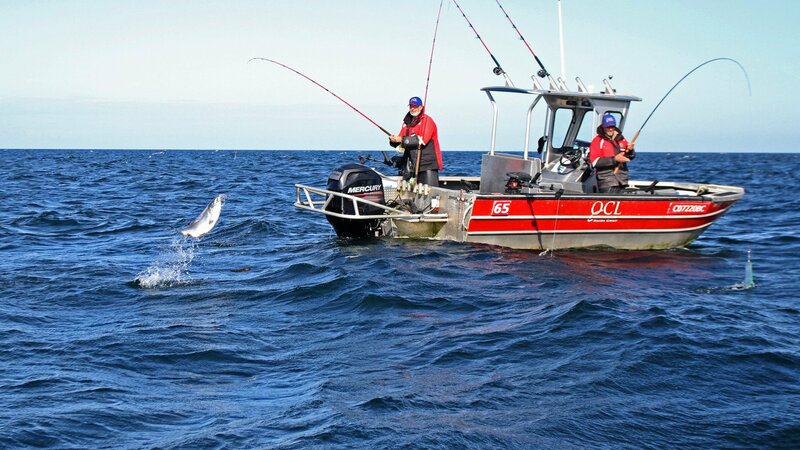 After leaving their natal streams they spend can spend 2 years, but as many as 8 years, feeding in the North Pacific with many ranging thousands of miles away from where they were hatched. 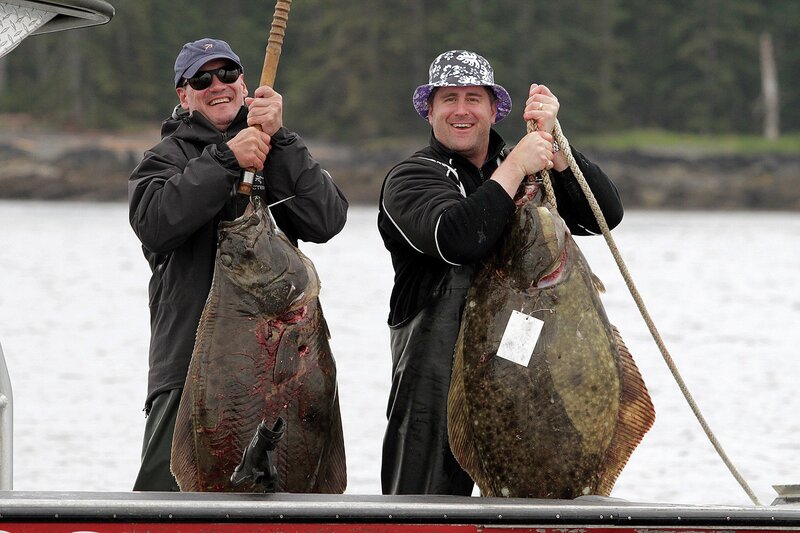 Most fish average 20 -30 pounds at maturity, but some specimens can reach weights of up to an astonishing 90 pounds! 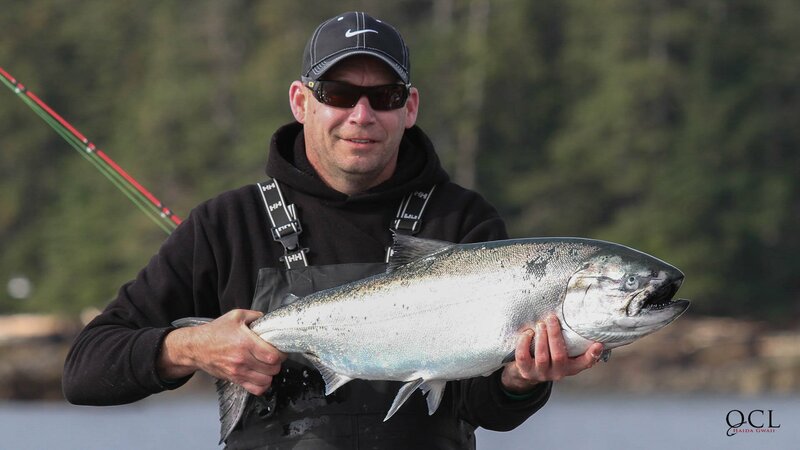 In addition to its large size, the Chinook is distinguished by its black gums, spotted blue-green back and a silver tail dotted with black spots. 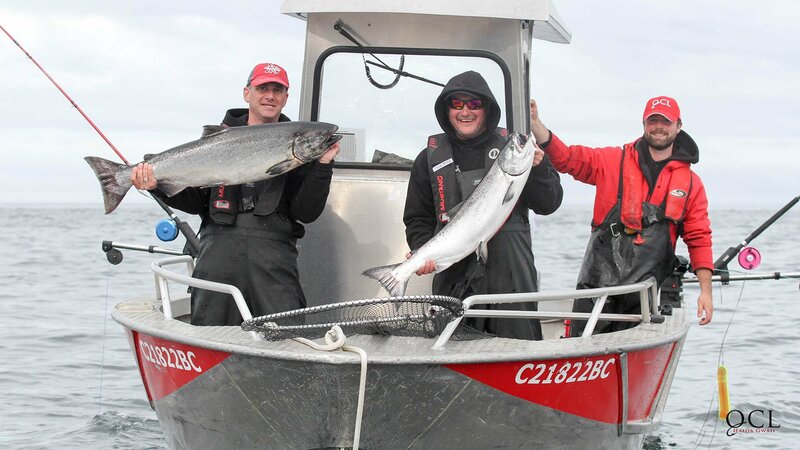 We do occasionally find them with very silver tails, rimmed with black and with very few spots. 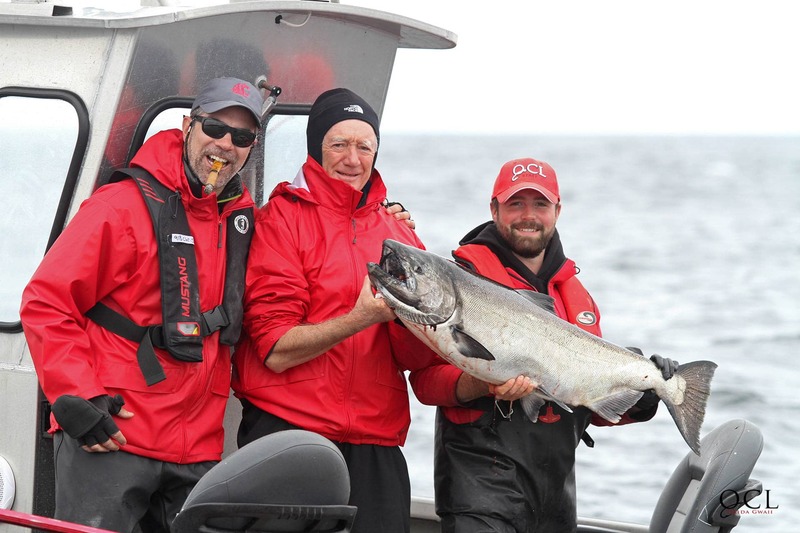 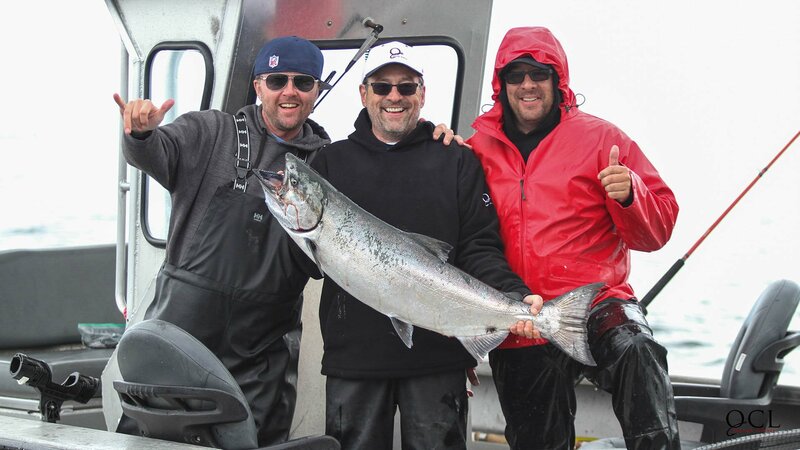 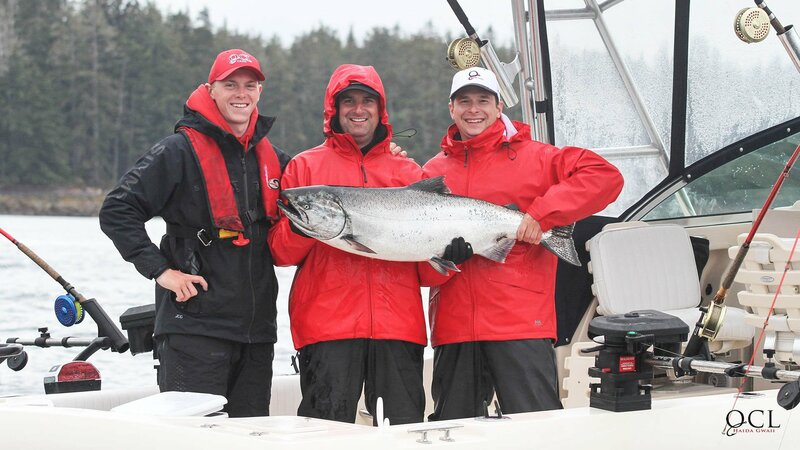 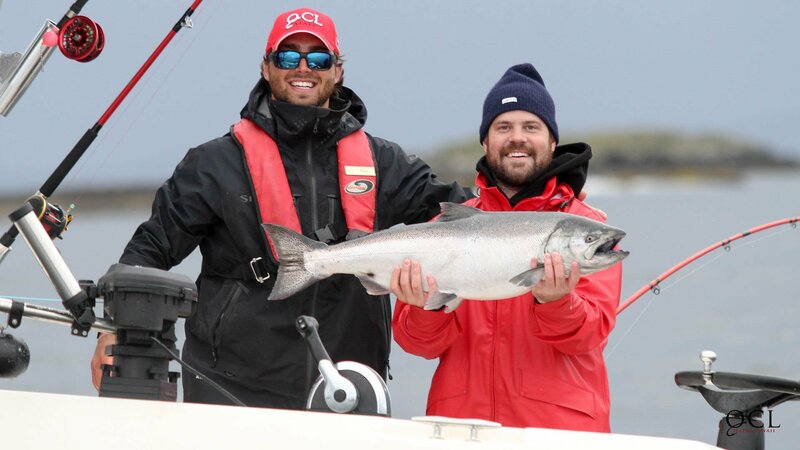 In BC the Chinook is often referred to as a Spring salmon while American anglers know them as Kings. 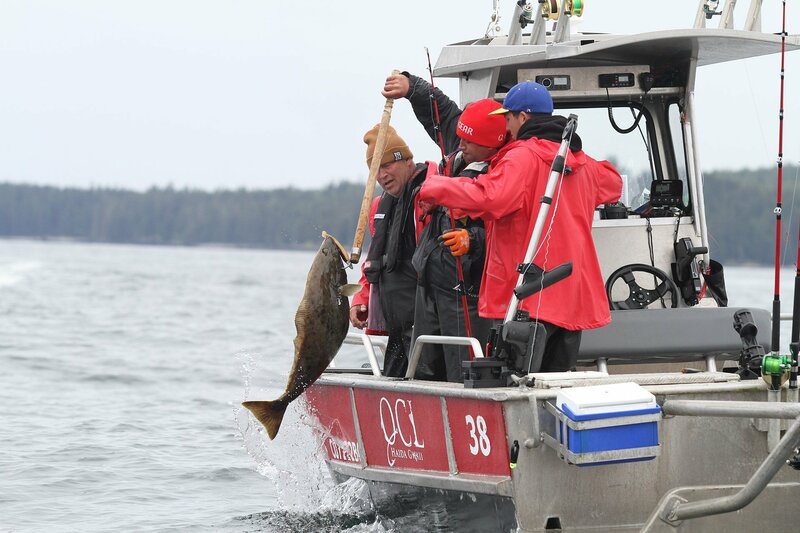 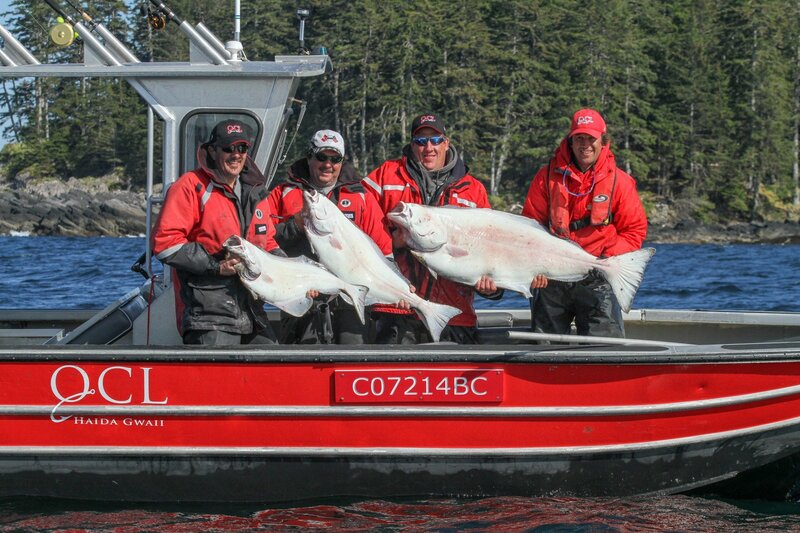 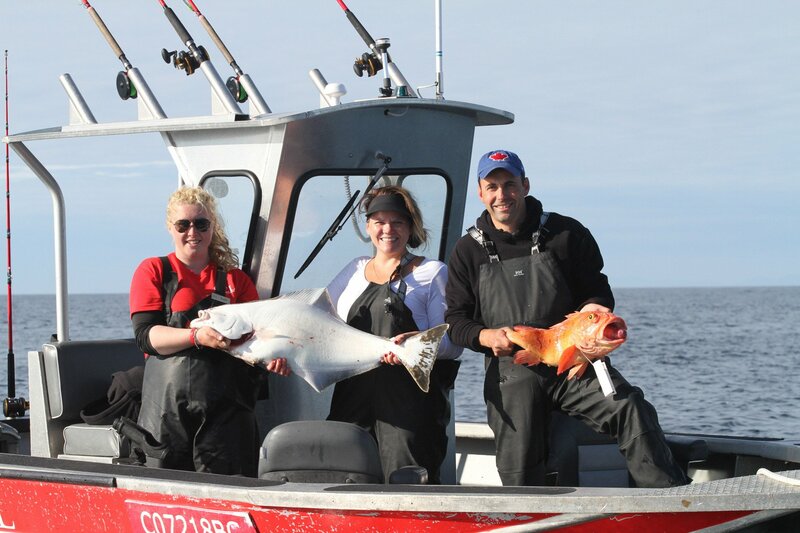 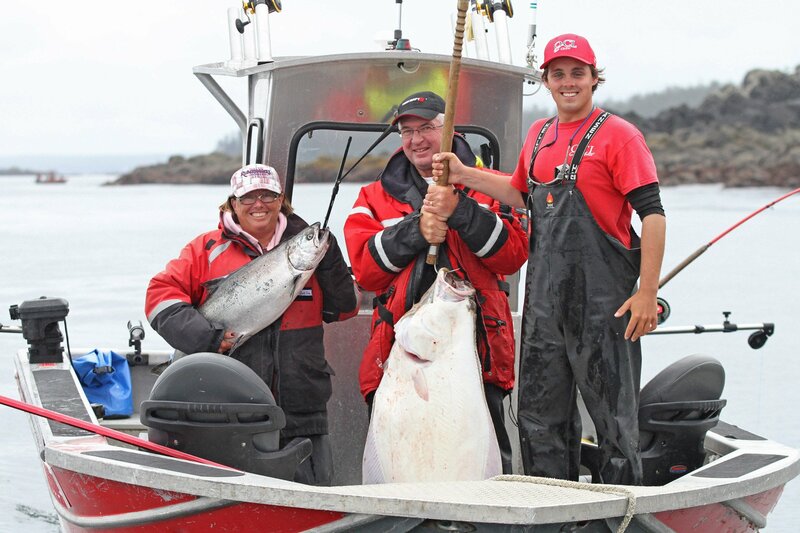 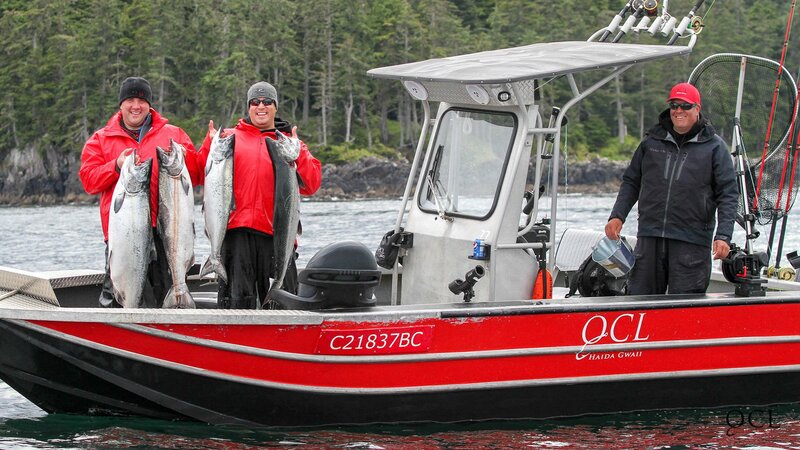 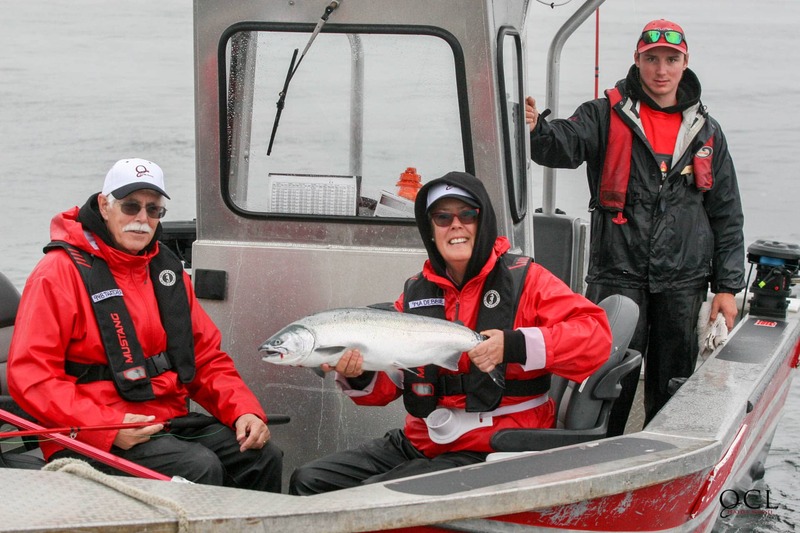 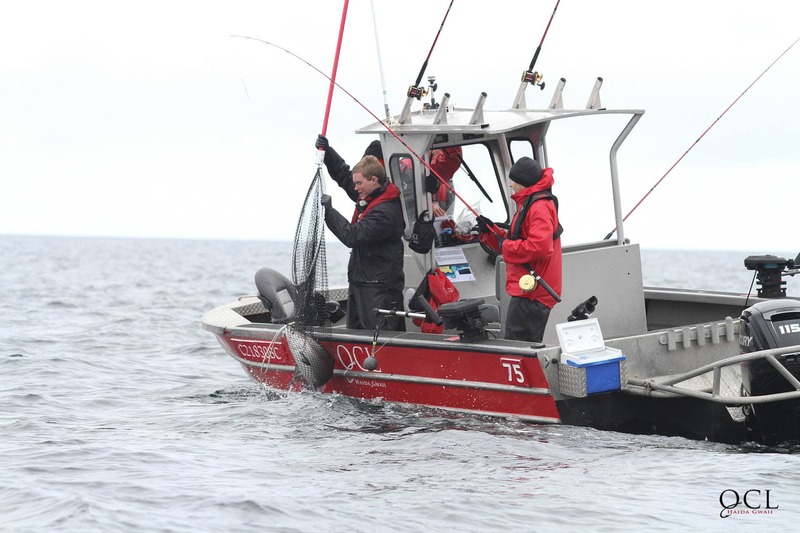 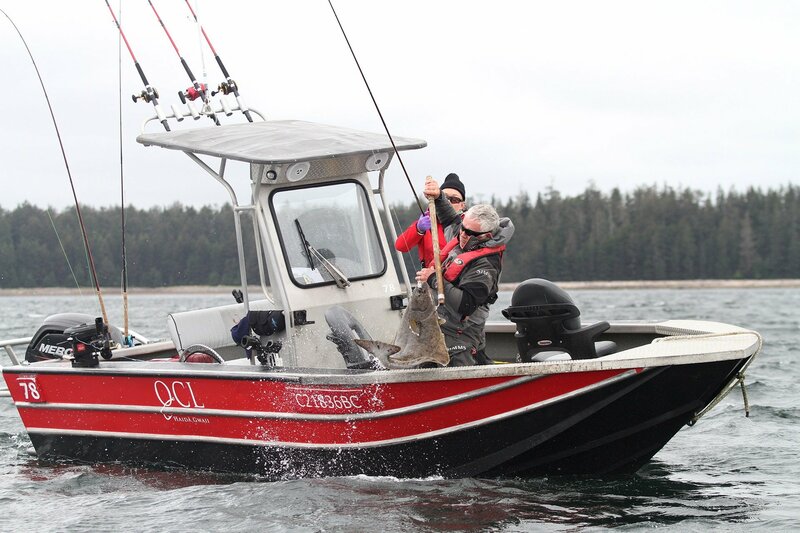 Those fish over 30 pounds are called a Tyee, a coastal First Nations word meaning chief. 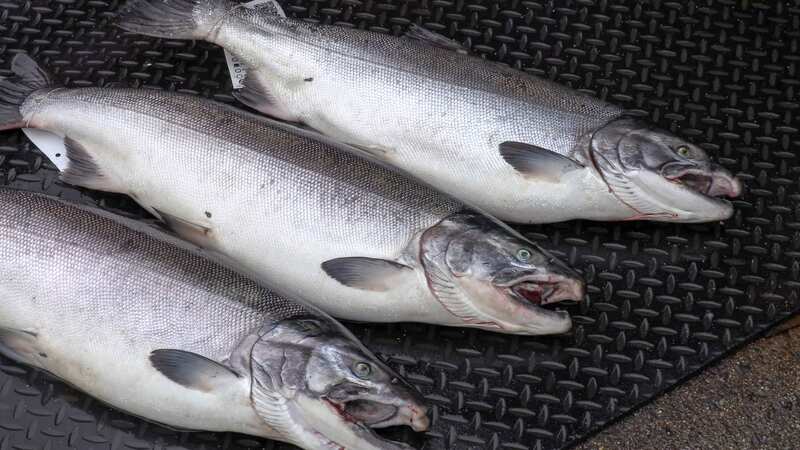 Often rated as the best tasting, the Chinook has the highest oil content of all pacific salmon. 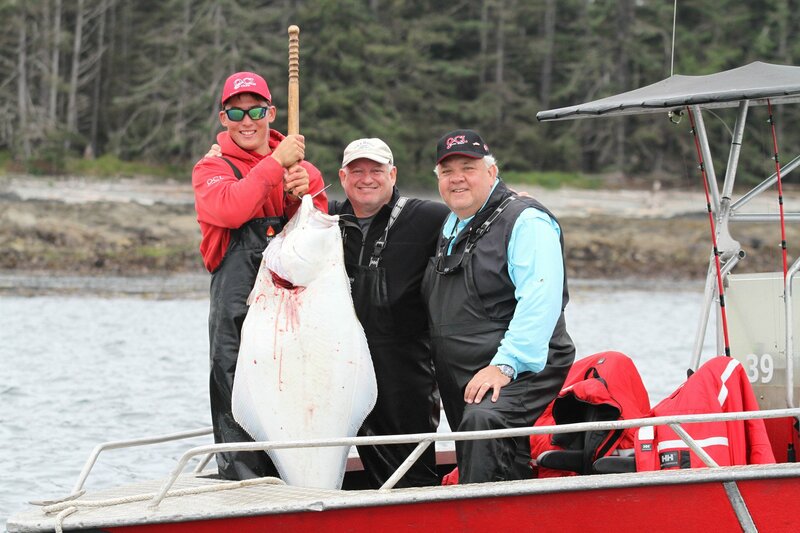 The flesh colour can vary from pink, red, white, and even marbled. 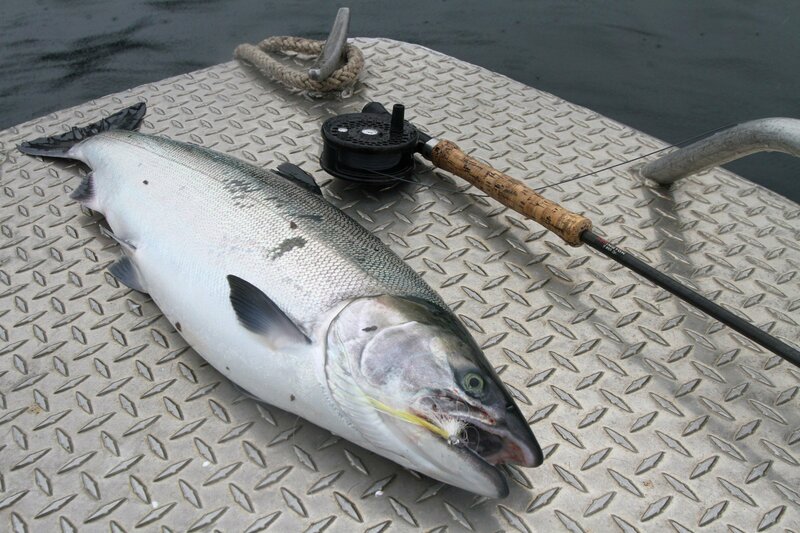 The Coho Salmon is a favourite of many salmon anglers, particularly light tackle and fly fishers. 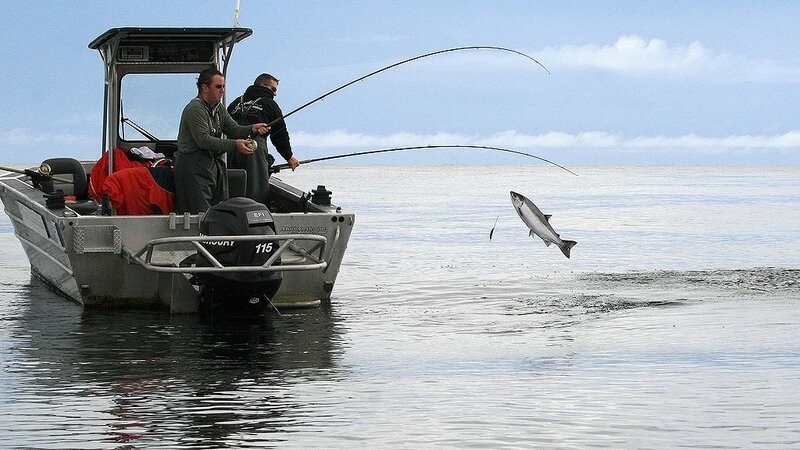 Its tendency to travel in large schools and an aggressive feeding style makes for great action. 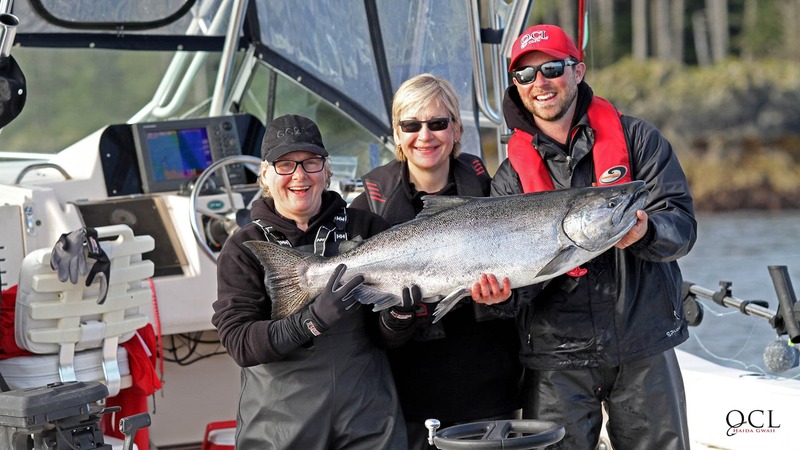 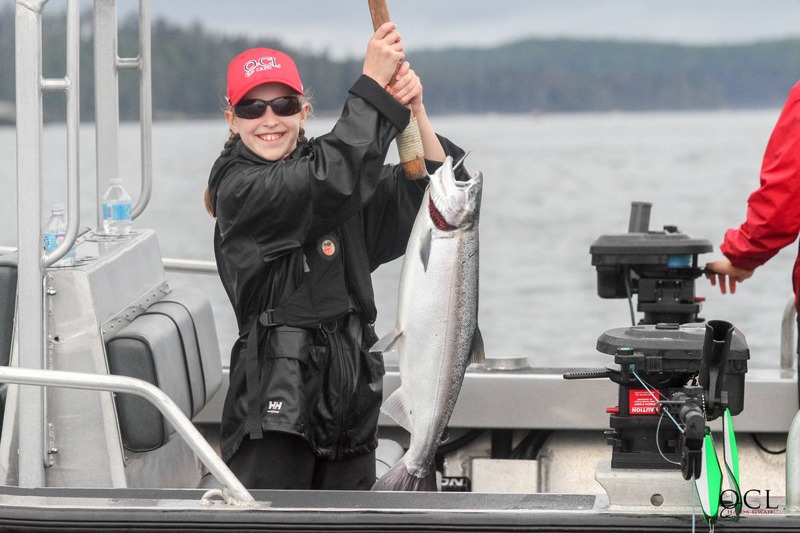 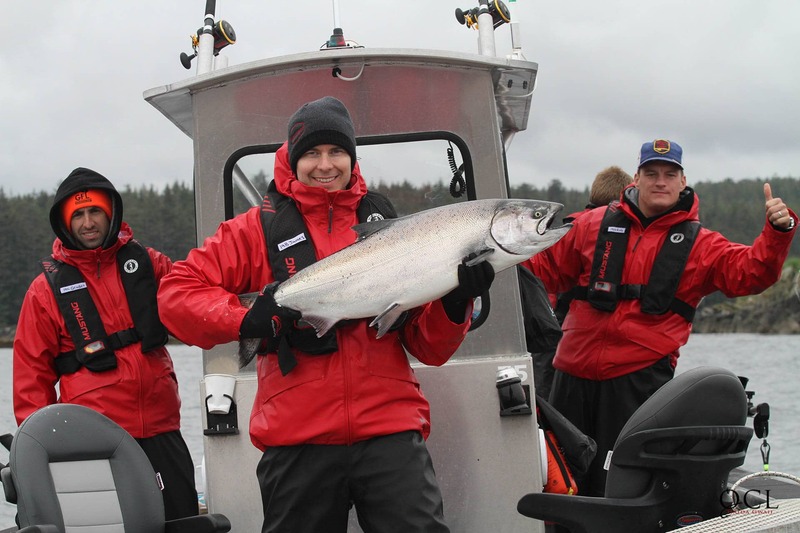 Coho usually live for 3 or 4 years and typically weigh from 8 to 20 pounds at maturity. 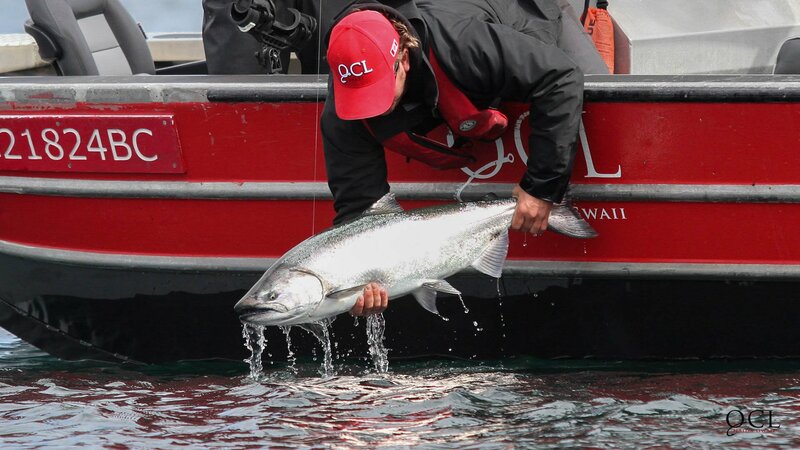 Coho have white gums, black tongues, dark blue backs, only a very few spots on the upper portion of their bodies and silver coloured tails. 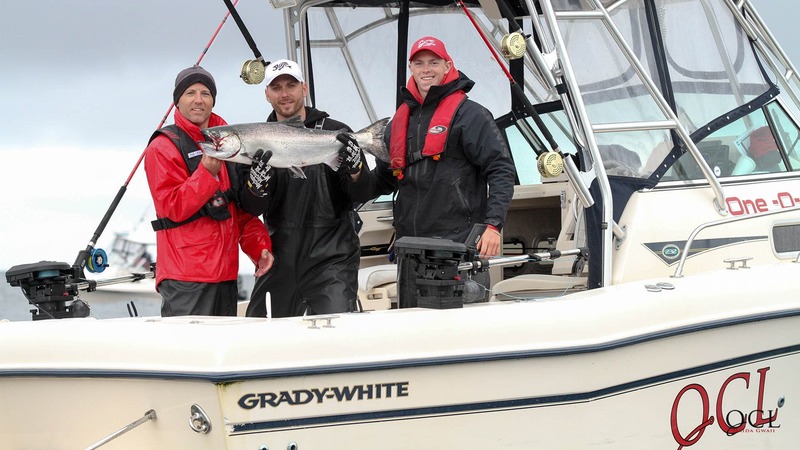 The Coho’s white gums at the base of the teeth and its square silver tail behind a sturdy “wrist” are its main distinguishing features. 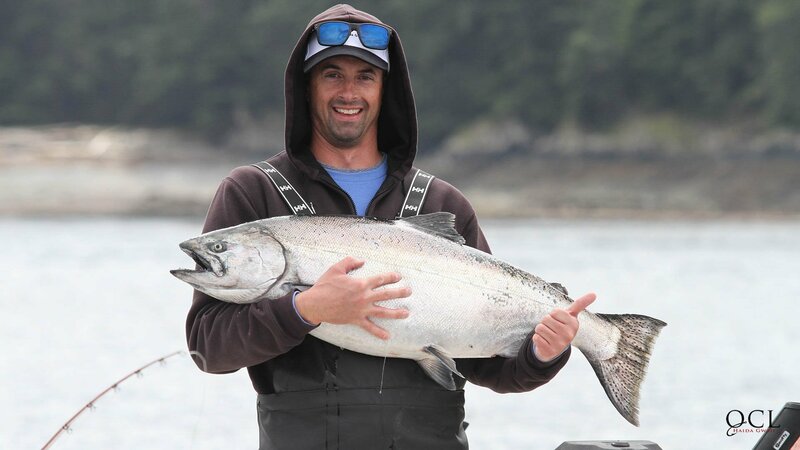 American anglers know them as Silvers, and juvenile Coho are referred to as Bluebacks. 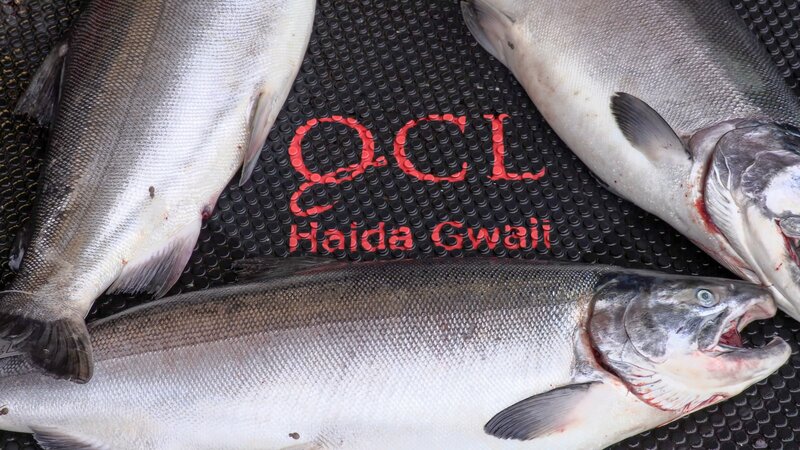 Coho are considered excellent table fare with its high oil content and delicious rich, red meat. 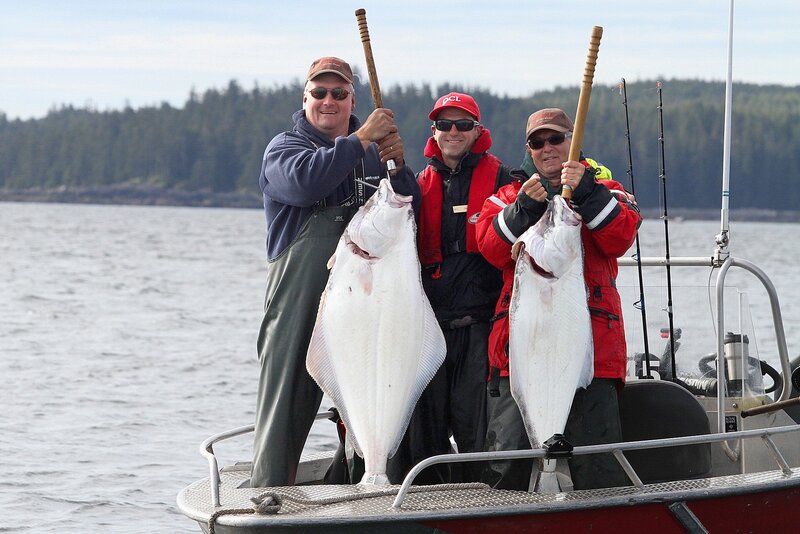 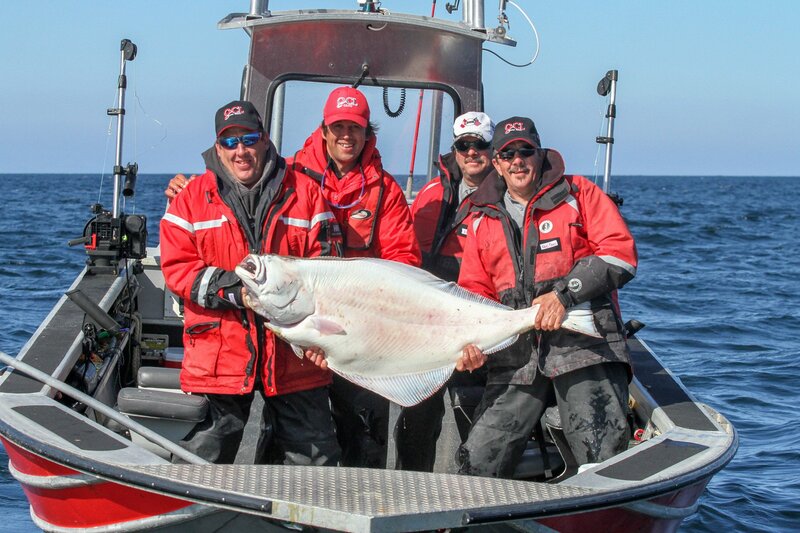 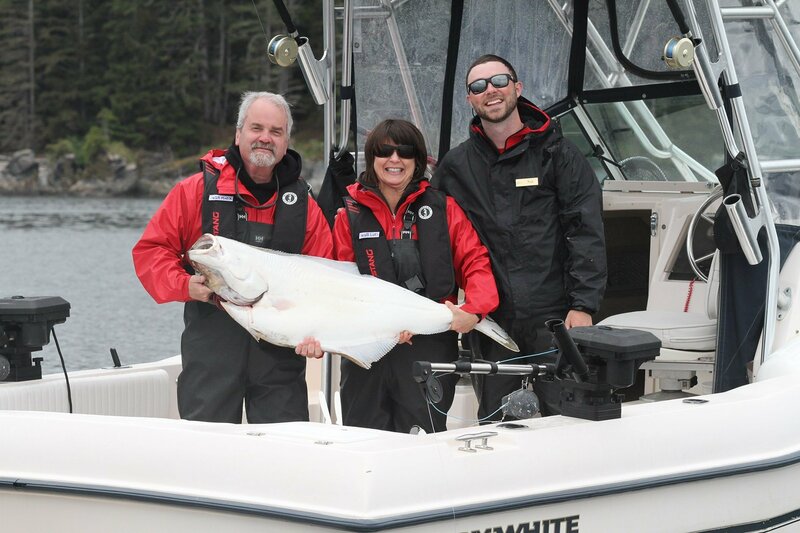 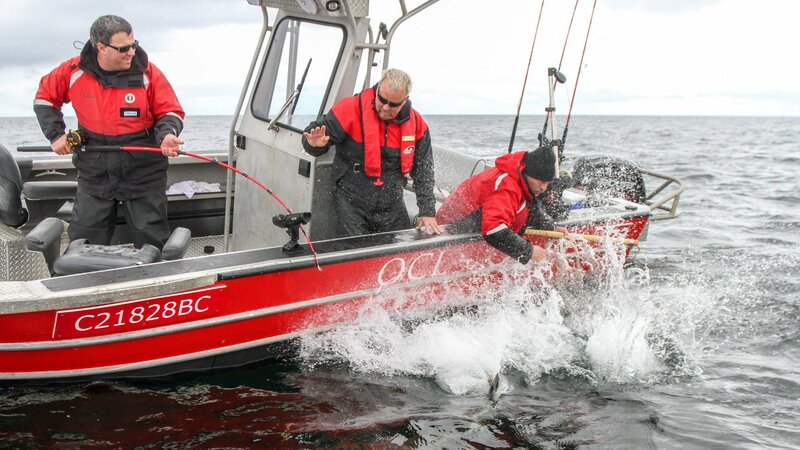 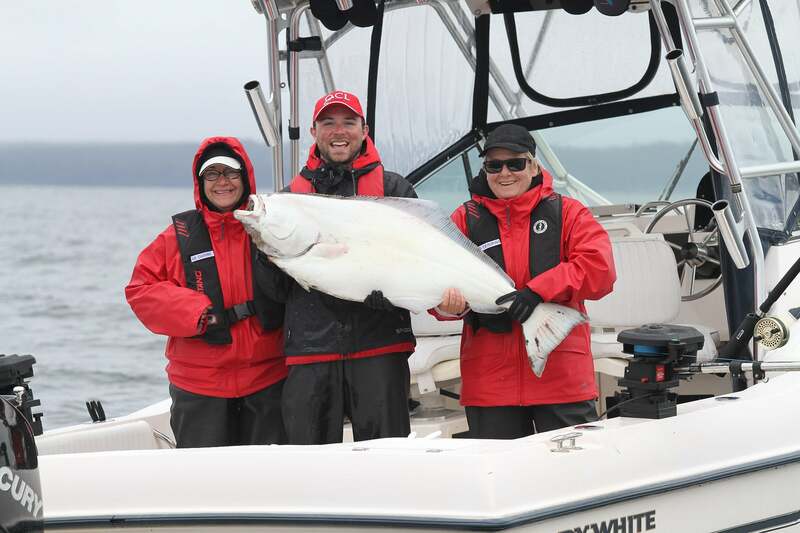 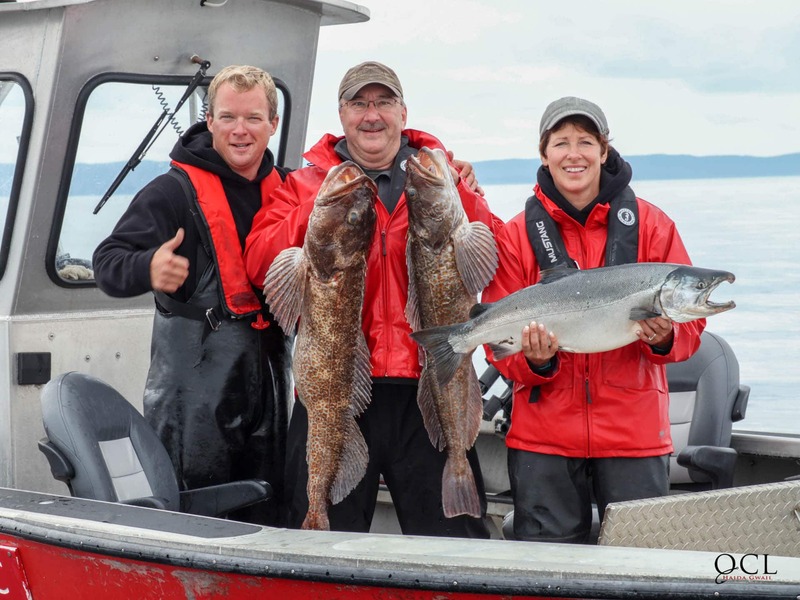 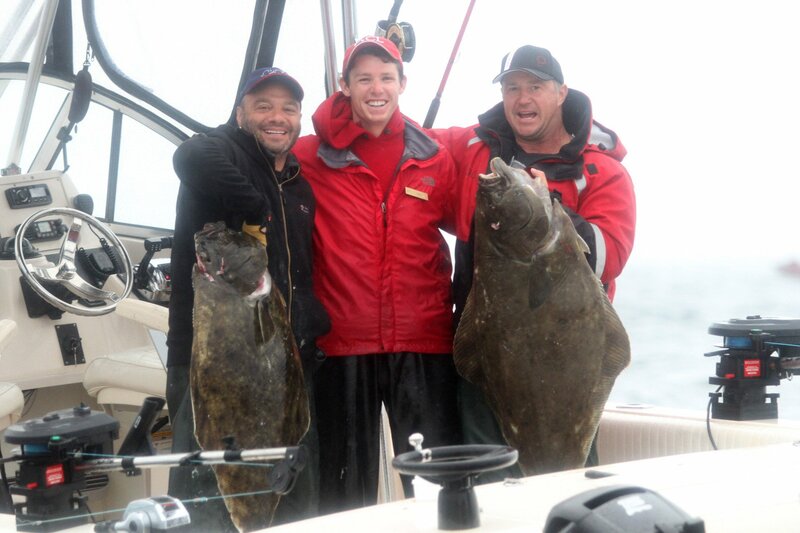 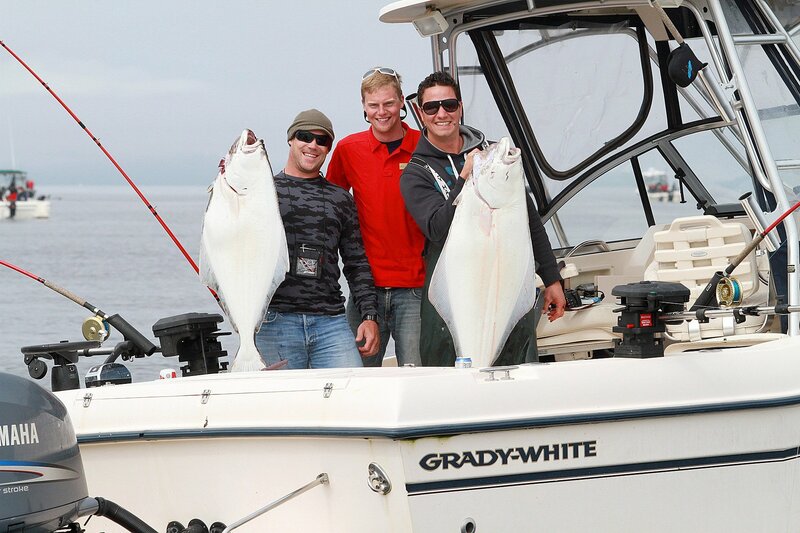 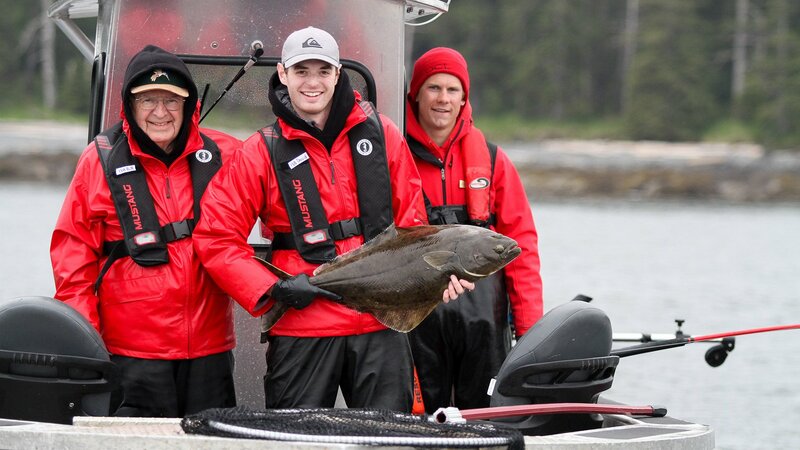 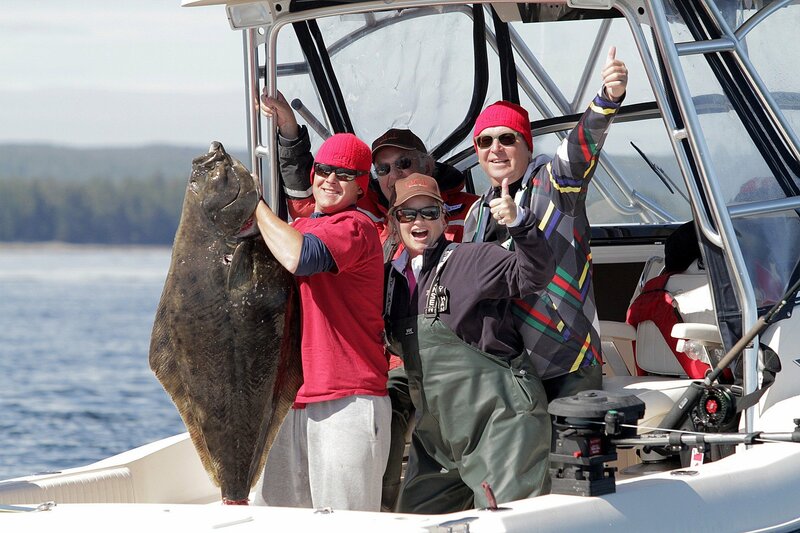 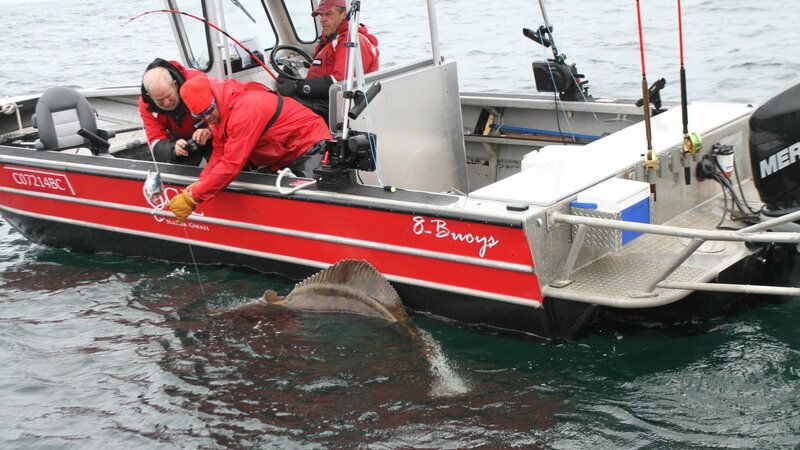 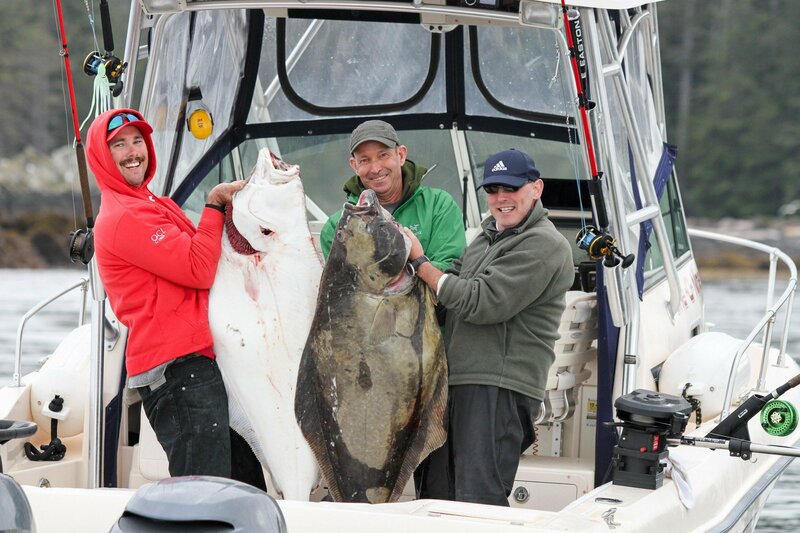 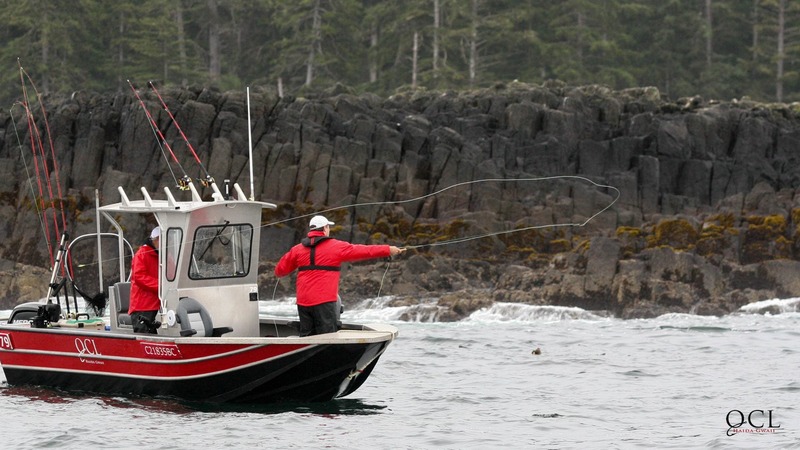 The Pacific halibut can provide plenty of excitement for the sportsfisher. 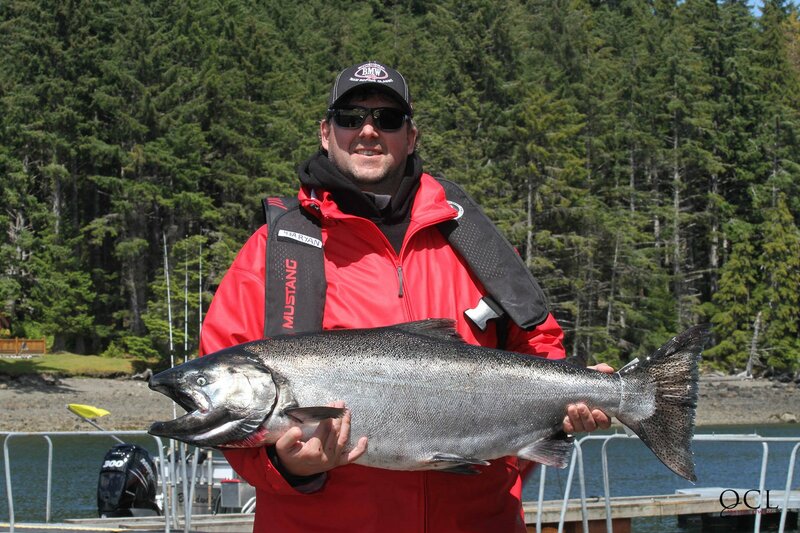 In our waters they range from 10 to more than 200 pounds and you never know when you might hook up with the latter! 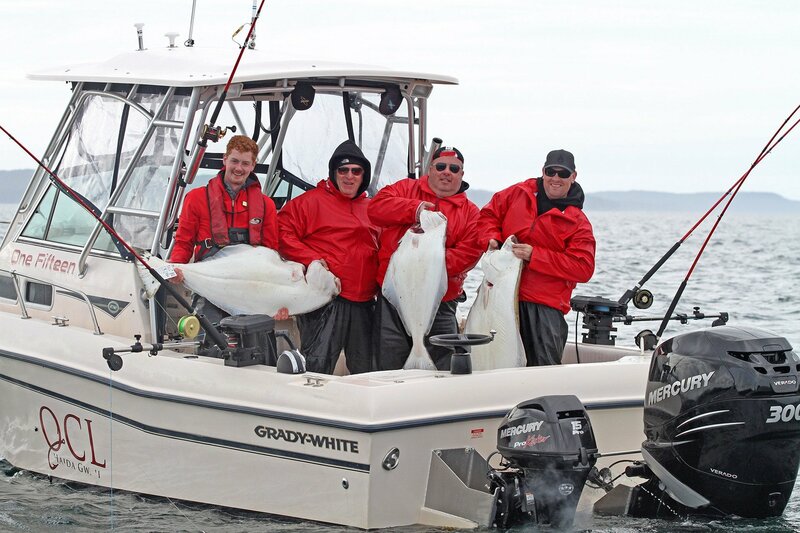 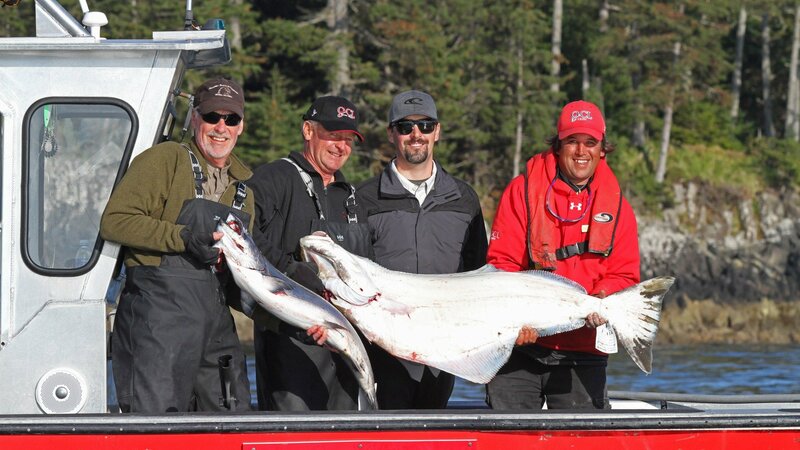 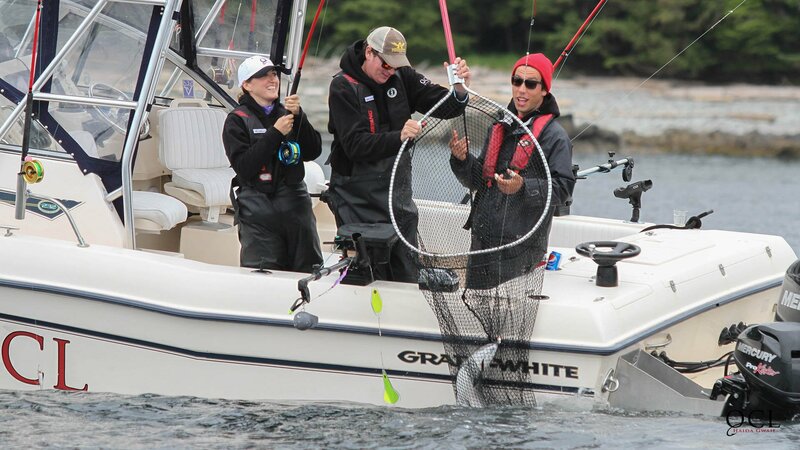 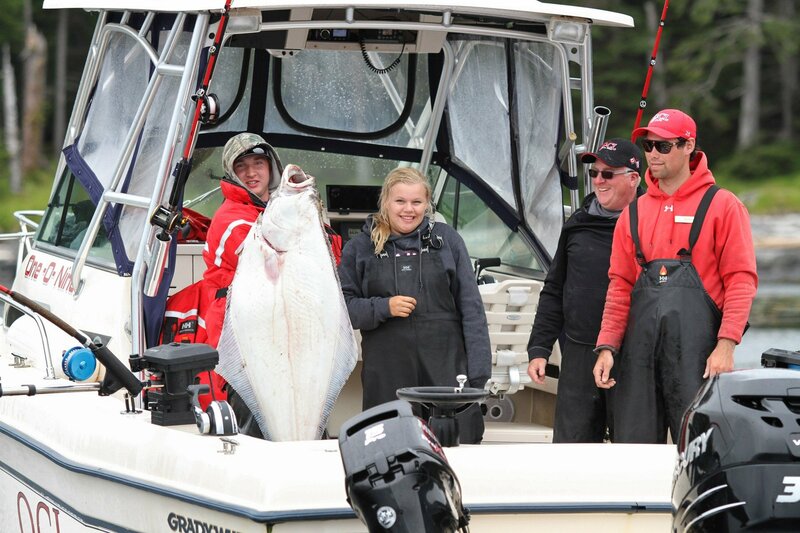 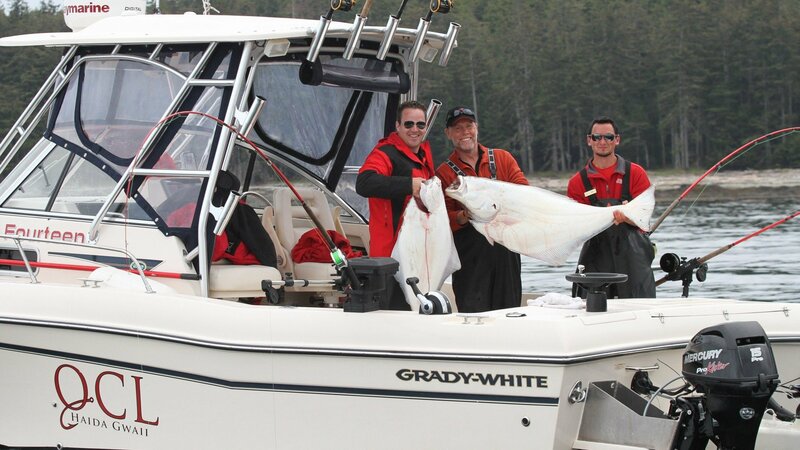 Many Queen Charlotte Lodge anglers catch their limit of halibut while mooching for salmon. 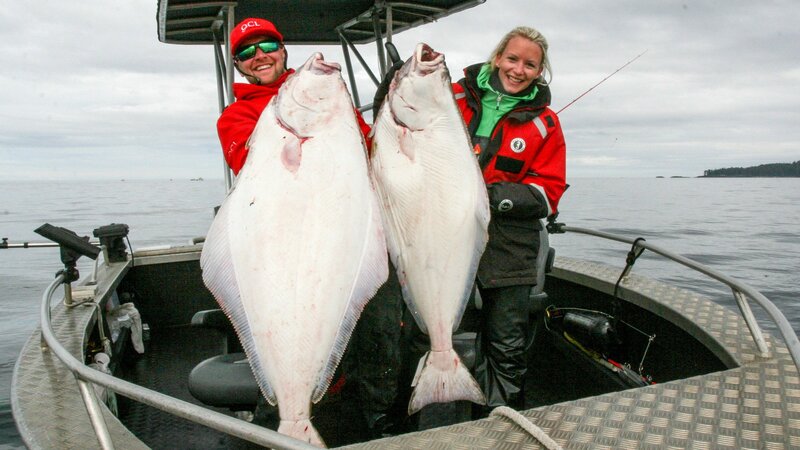 Pacific halibut can grow to massive sizes – more than 400 pounds – but fish 10 to 50 pounds are much more common. 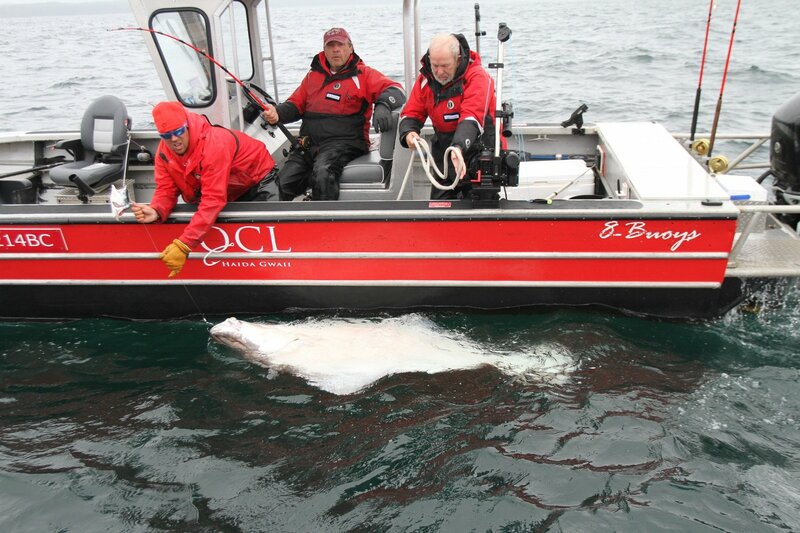 Halibut begin their life swimming “upright” like most species of fish but when they get to be just over an inch long, their body starts to change. 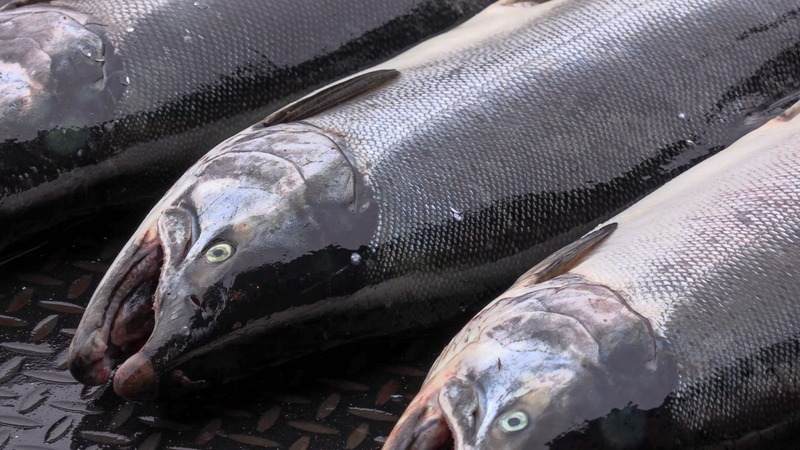 Their left eye begins to migrate over to the right side of their head and their body gradually rolls over to “normalize” in a horizontal aspect. 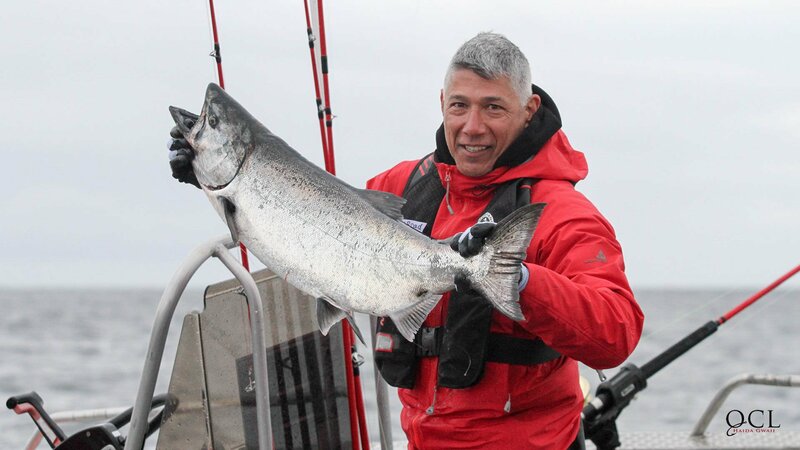 The upper side turns a dark olive grey-green while the lower side turns white. 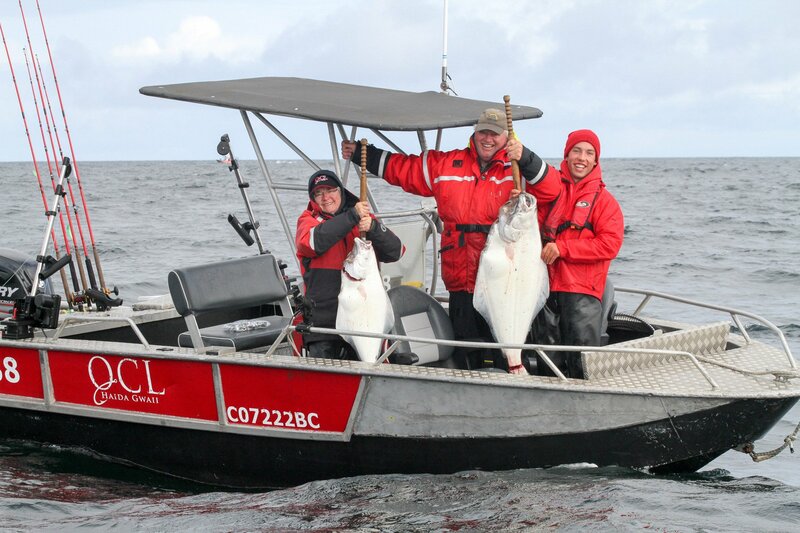 While they do spend much of their time near the ocean floor halibut will pursue baitfish and move back and forth between the depths and waters as shallow as 25 feet. 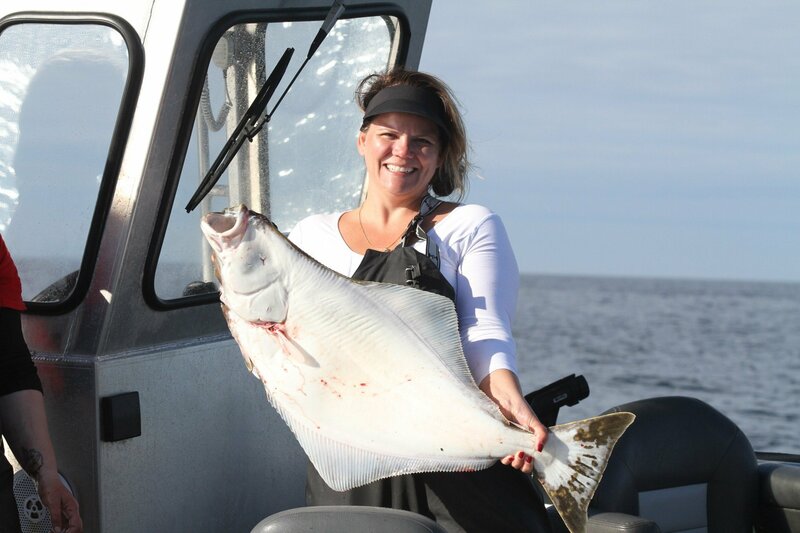 Halibut are excellent eating with a mild, sweet taste. 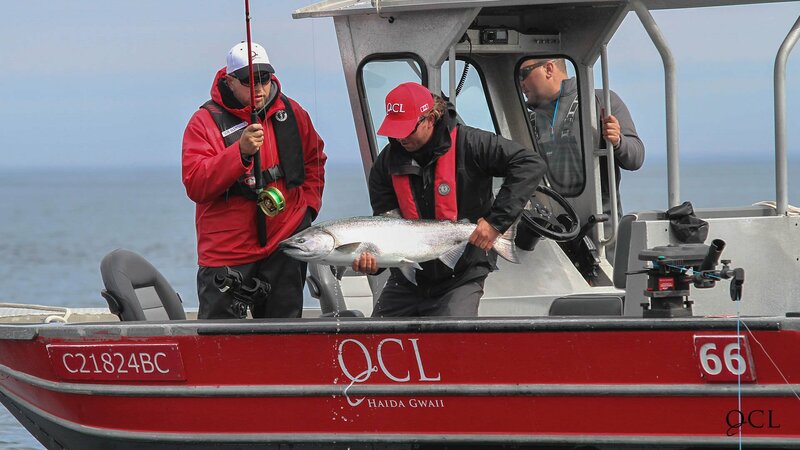 There were lots of fish when we went in early September, even thought the main Chinook runs were at the tail end. 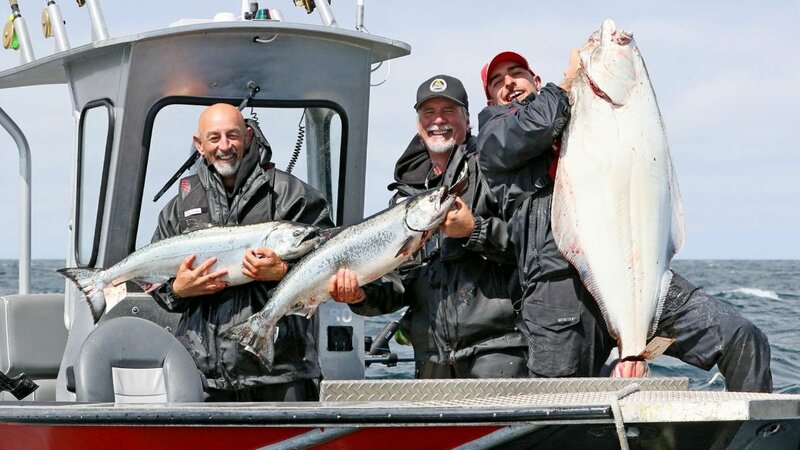 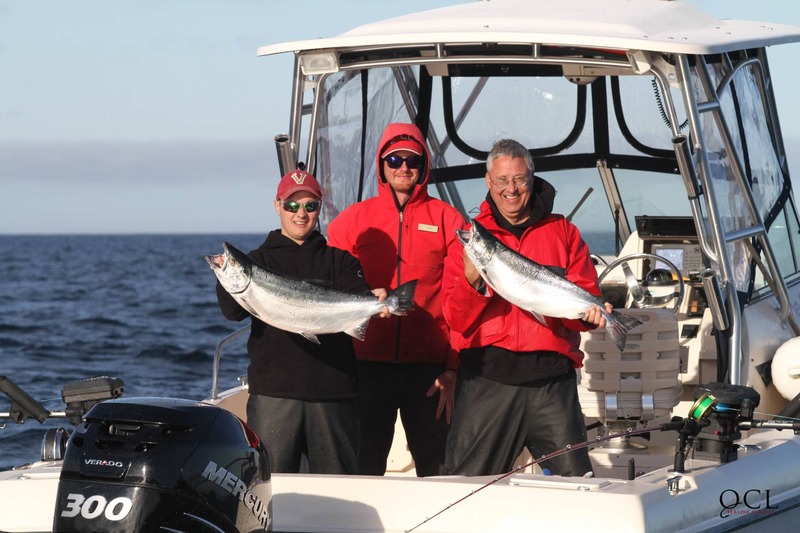 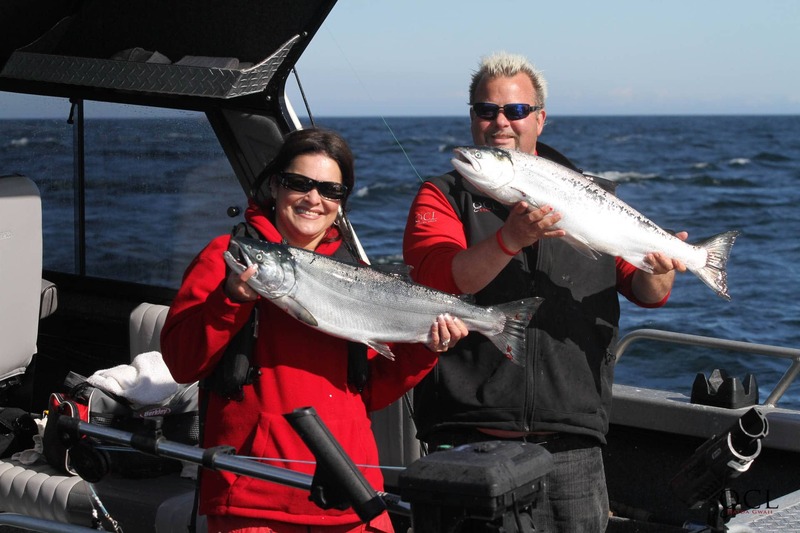 The bottom fishing was some of the best I have seen anywhere and we caught eight species of fish in one day – Chinook, Coho, Halibut, Lingcod, Yellow Eye, Tiger, Silver-Grey and Black Bass – a record for me! 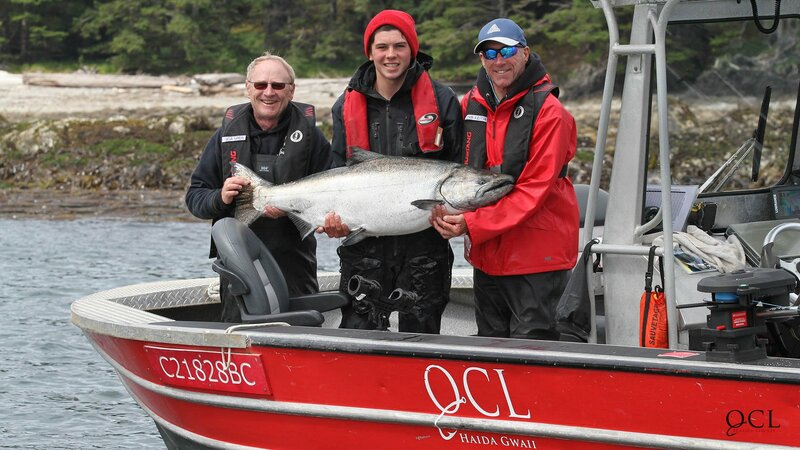 I highly recommend QCL and guarantee you will not be disappointed.